Soneva Fushi was the first luxury resort in the Maldives, located in the stunning Baa Atoll, a UNESCO World Biosphere Reserve. 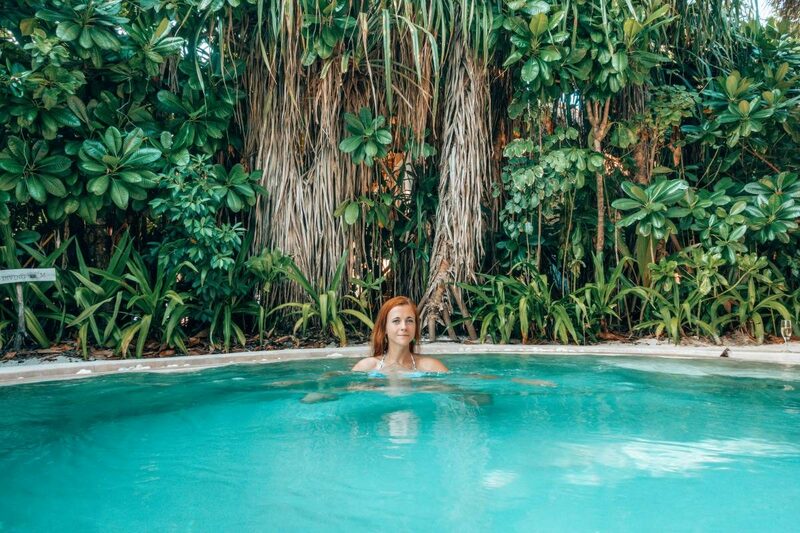 It’s the closest you can imagine to what a tropical paradise must be, and despite it being a resort, you won’t experience any drunken pool parties or other cheesy things some resorts love to do. It comes as no surprise that Soneva Fushi has 60% return rate, and I personally experience guests crying and hugging their Mr. Fridays before they left. 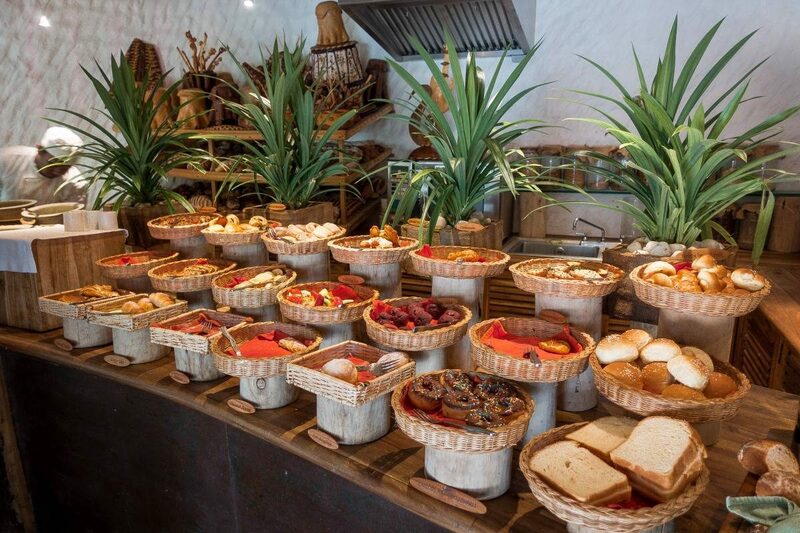 Everything is personalized at Soneva. Even before I arrived I received a questionnaire to fill my preferences about my food, room, including a given choice of about 40 types of pillow and sheets (half of which the existence I had no idea about) with preferred scents. Crazy, and awesome at the same time. Who is Mr. Friday? Soneva chain specifically calls all personal butlers Mr. or Mrs. Friday, named like in Robinson Crusoe’s books, as they act like Mr. Friday and are there to make your stay comfortable. They’ll book your dining experience, arrange excursions, take your photos and simply – be your friend. You can call him or her anytime, even to help you find your lost glasses. Soneva Fushi is also one of the biggest islands in the Maldives, being just under 1.5km (0,9 mi) long and 0,5 km (0,3 mi) wide. With less than 100 guests at full capacity, you’ll barely see any other people aside from meals. Even during meals time, it never felt crowded. I took a seaplane from Male in the morning, after a quick stop in a first-class Soneva lounge. I didn’t have to wait for my flight on hard stools in the heat but relaxed on comfy sofas with champagne in my hand. The flight took 40 minutes, which for the Maldives it’s quite a long domestic flight, giving me incredible views of colorful atolls. Seriously, it was my first seaplane and it’s definitely a breathtaking bucket list experience. We landed at their airport, basically a wooden platform, where the boat was already waiting for me for a 5-minute drive to the resort. This is when I was given a bag for my shoes, according to their ‘no news, no shoes’ policy, everyone including the staff was walking barefoot. I loved it! 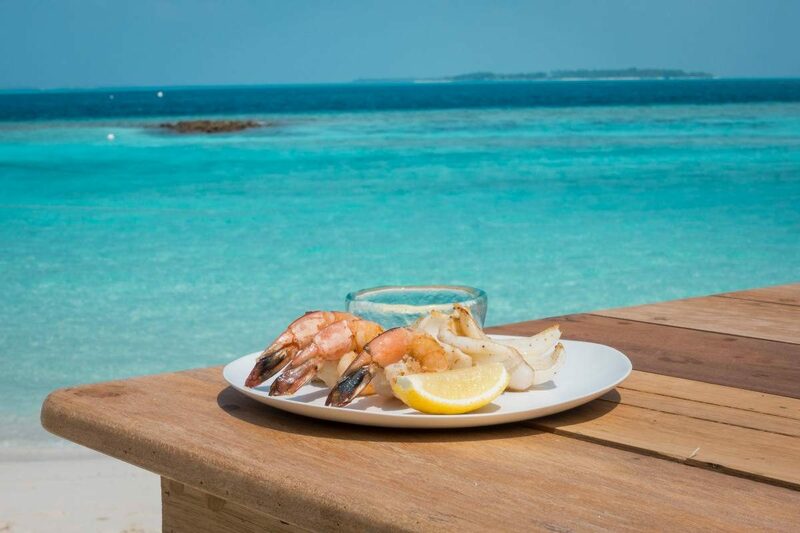 It really encourages a casual atmosphere among all the guests and after talking to some guests about their preferences, they loved Soneva for not being pretentious. Upon arrival, there were no lines to the reception or any reception at all. Not even awkward sitting on a sofa with a welcome drink while you wait for someone to attend you. I was dropped off at the shore and met by my Mr. Friday. And so was mine. He escorted me directly to my villa and showed me my bike. All guests use bikes to get around the island, as it’s a part of being a sustainable resort. Speaking of sustainability, Soneva Fushi (and their partner resorts) are luxury resorts that are fully environmentally friendly. There’s no unnecessary lighting anywhere and where it can be, it’s natural. Soneva has its own recycling center on the island and even in guests room, every bag and box was reusable with no plastic. And that, on top of growing their own produce in the garden that guests can visit – they even have a special mushroom room! 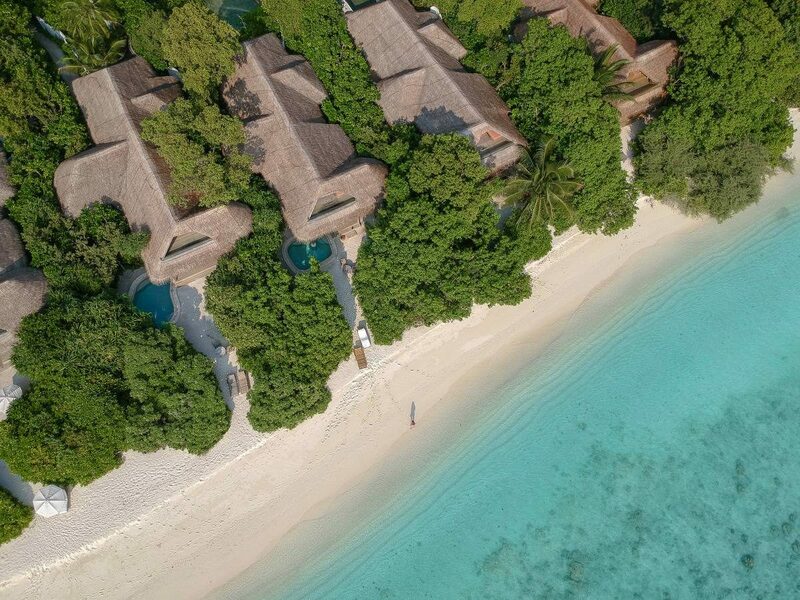 As part of its eco-conscious commitment, Soneva Fushi does not offer over-water villas, due to the damage their construction causes to the coral. All accommodations are beach villas. Each villa aims to provide a sort of Robinson Crusoe experience. I had my own garden with a hammock and private pool, and a stretch of white sand beach just steps away. In keeping with the castaway theme, many villas are built to resemble tree houses and so was mine. Even my bed was made out of a real coconut. The best part of my villa was, without a doubt, the bathroom. When I opened the door I was welcomed by an outdoor area, partially covered up, and on top of a regular shower and separate toilet, was a bathtub overlooking a water garden. Next to the waterfall on the side of my garden, was a stone pathway to an outdoor shower, in the middle of an elevated garden. 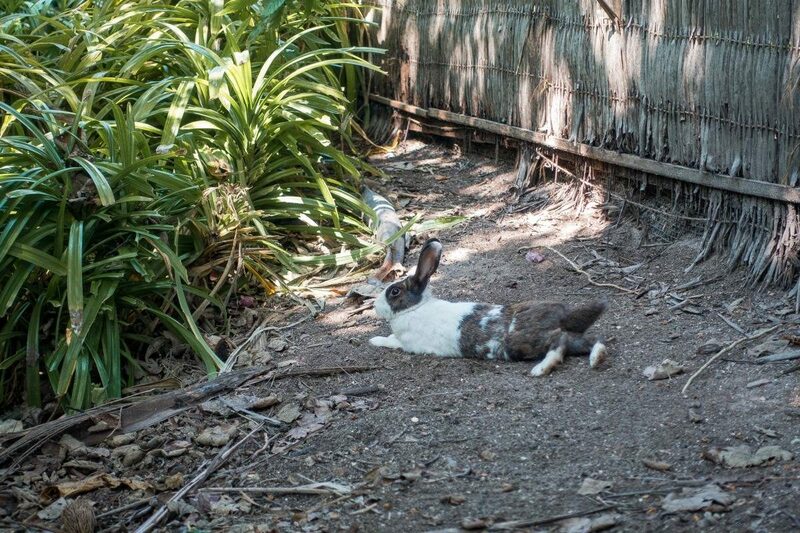 When I took my bike for a stroll, I stumbled upon a ton of bunnies running around the resort and I adore bunnies. 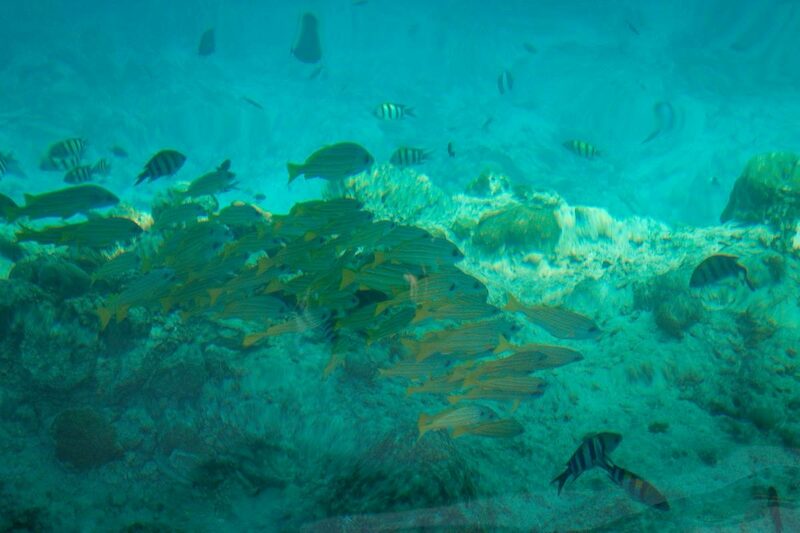 They’re wild, but the resort takes care of them and does check-ups on them including vaccinations, so don’t be afraid. You’ll love them! Even though I have no kids at the moment, I was blown away by The Den – one of the biggest kids clubs in the Maldives. It’s a giant jungle villa where kids can go to a music room, kids cinema, nap room, Lego room, and some other crazy toy rooms. On top of that, there was a gigantic pool with slides and hidden surprises. Before coming to Soneva Fushi I read about their dedicated 24/7 chocolate and ice cream room, featuring 60 flavors of ice cream. For an ice cream lover, it’s a treat. I arrived right in time for breakfast with my first thought being: glad I only have a short time at this resort because if I stayed a full week I’d leave a few sizes bigger. The food was out of this world and the best out of all places I stayed there in the Maldives! There were indoor and outdoor set-ups: fruit station, egg station, sushi station, Asian fusion station, bread room, jam & honey room, fresh salad room. I’ve been to luxury hotels before, but this exceeded my expectations. I’ve never eaten so much caviar in my life as I did for breakfast at Soneva Fushi – guilty as charged. When I returned for lunch, still full from breakfast, I couldn’t decide what I wanted to take as I wanted everything. I ended up having freshly grilled calamari with shrimp and I didn’t regret my choice. I had dinner at Fresh in the Garden restaurant, cooked by Chef Sobah, who won the ‘Best Chef in the Maldives’ Award. 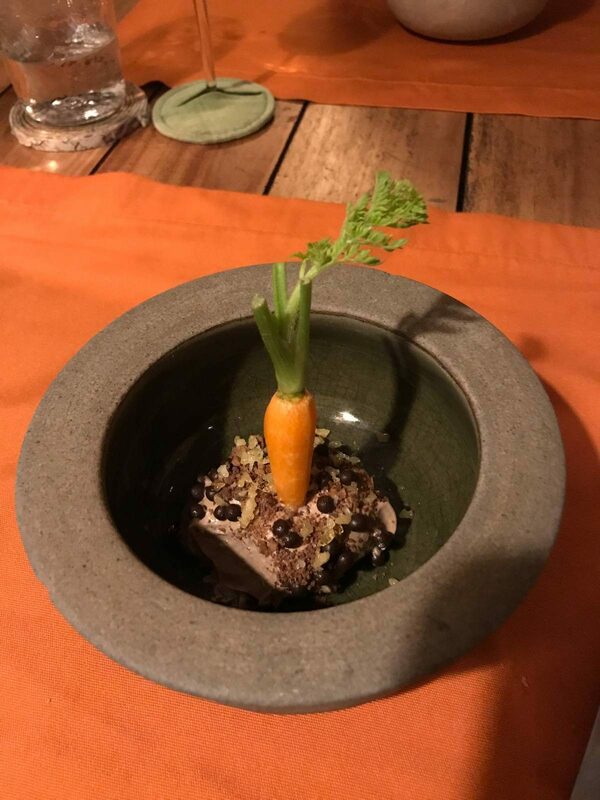 It was traditional Maldivian cuisine with modern twists. Both the main course (fish) and dessert (the cutest looking carrot cake) were spectacular. After dinner, I went to do some stargazing through a giant telescope. 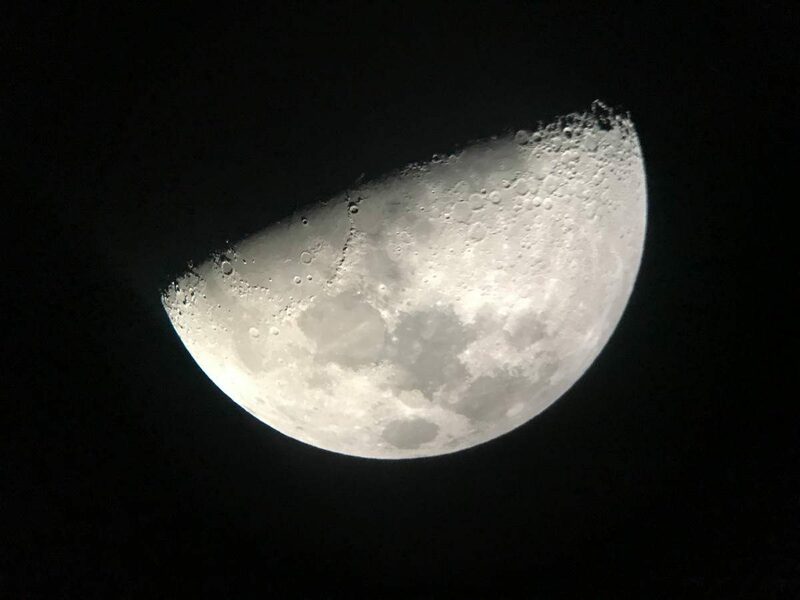 I saw many stars that I haven’t been able to spot before, and also, the moon. While I didn’t have time to scuba dive, I went on a sunset dolphin cruise with other guests. 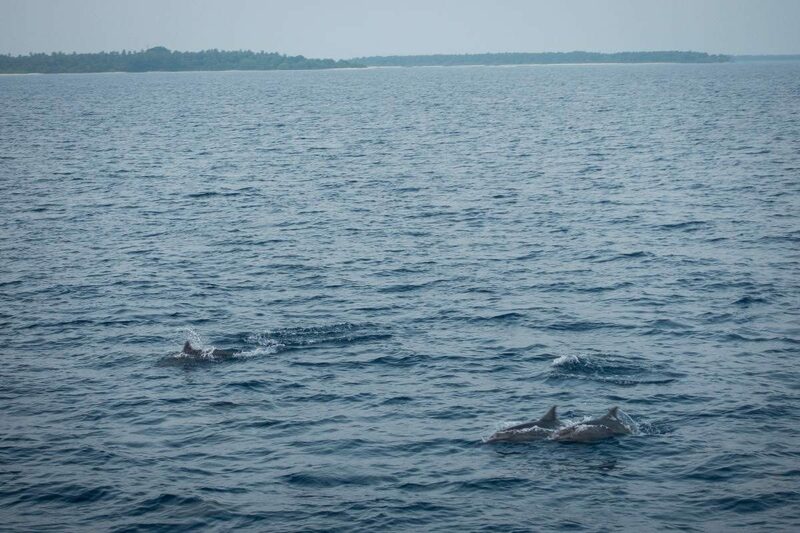 I’ve been on a dolphin cruise before, but I’ve never experience seeing a group of dolphins about 5 minutes from the time we left the shore. It was so magical! All guests were also served champagne and various ceviches, all of them delicious. In the morning I went to a small local island of Maalhos, but I’ll describe my experience in a separate post. I totally recommend the trip though. 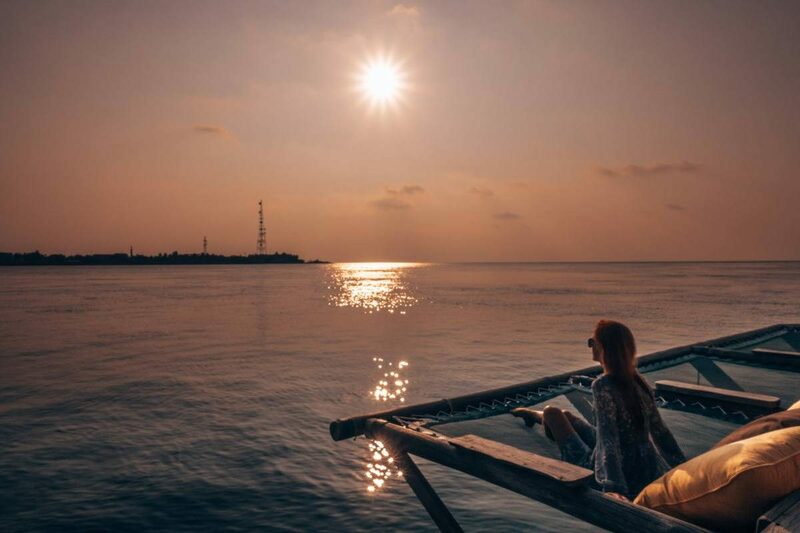 Are there any cons of Soneva Fushi? One thing that initially bugged me, but I quickly got over it, was a view from my villa being blocked by a big local island of Eydhafushi, the capital of the Baa Atoll, with high antennas and buildings. 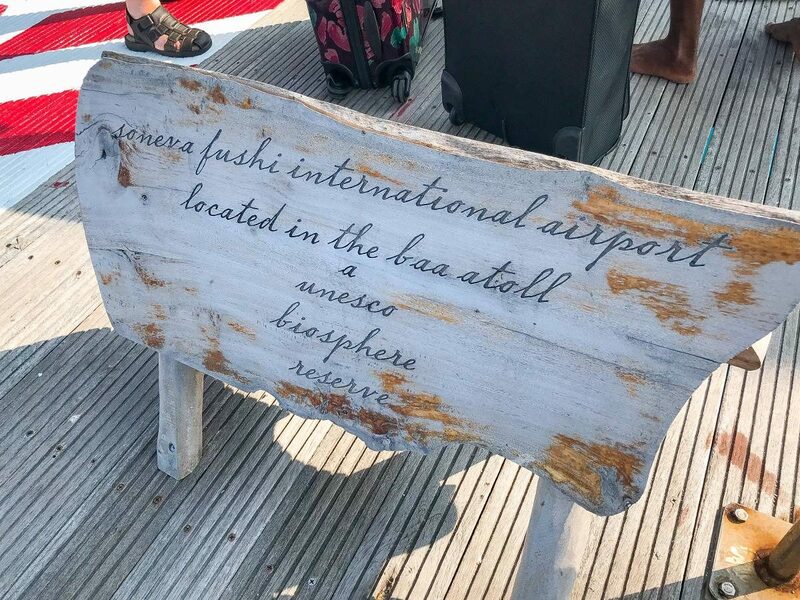 Be warned: all your other luxury trips will look not so great comparing to the memory of your Soneva Fushi stay. During my stay at Soneva Fushi, I was able to tour the other “resort” – Soneva in Aqua. As the name indicates, it’s a boat that you can rent along with the friendliest captain I’ve ever met (seriously, not kidding) and a private chef. The two-cabin yacht has a maximum occupancy of four adults and two children. As such, it provides the ultimate sense of exclusivity and privacy. With Soneva in Aqua you can go anywhere you want, depending on the number of days, but I can see why some guests would like to stay there and slowly sail towards Soneva Jani after their Soneva Fushi stay. The yacht itself is pretty crazy. It has a secret jacuzzi in a master bedroom and another one on the deck in front of an outdoor cinema. I’m surely coming back one day! 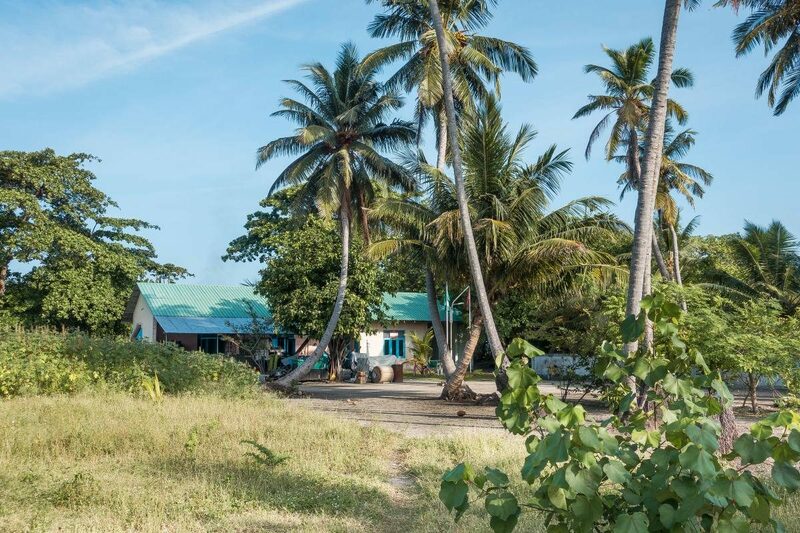 Check prices of Soneva in Aqua here. Who wants to visit Soneva Fushi now? 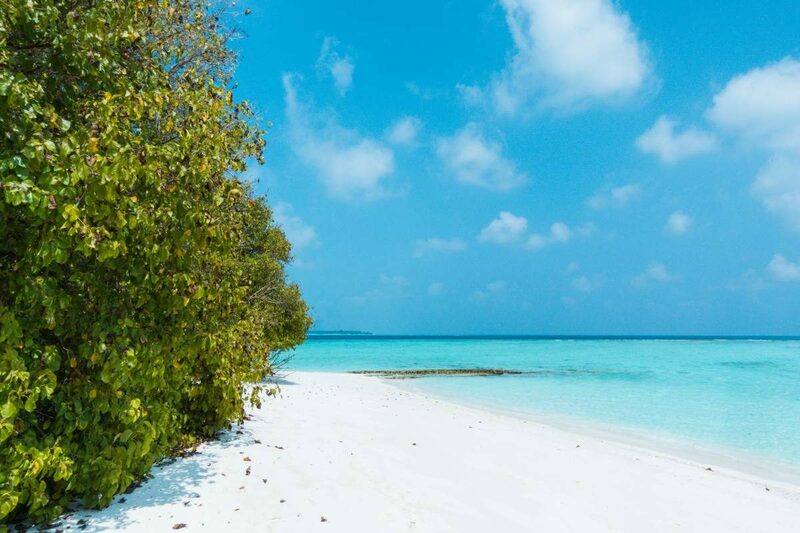 Check prices of Soneva Fushi here. Previous Post Should Travelers Eat Controversial Local Food Abroad? I totally love all the details in this one, and the rabbits are so adorable …. I have a question that’s not very relevant to this post, but I would really like to hear your thoughts about language when writing a travel blog. I want to start one myself, and as english isn’t my native language, I’m concerned about if people will get bothered by the fact that my grammar and sentence structure might not be 100% correct at all times. The reason I’m asking you is because I know you’re from Poland, and I guess english isn’t your native language either? Did you have any struggles with writing in english during the beginning of your blogging career? I think my english writing skills are pretty good, but it’s far from perfect. Any good tip regarding this topic? Do you need to write in perfect english if you want to be successful? Or is it more about content? Your blog inspire me so much!! Hi Emilia! Personally, I haven’t had that issue because English is my best language now (if this blog was in Polish then people would really laugh at my language skills haha!). If we’re talking about small mistakes then don’t worry about it too much at first (judging from your comment, I think you’re English is more than fine 😉 ). You can also consider having someone proofread your posts before publishing them. P.S. You could also consider writing in your native language – there are some successful blogs in Spanish, Italian, Polish, Portuguese, German etc. Anna, thanks! And thanks for sharing your great posts every week! Anna, thank you for this post. Its very inspiring.